©2016 ob/Kaikai Kiki Co., Ltd. All Rights Reserved. From Friday, January 20 to Thursday, February 23, 2017, Kaikai Kiki Gallery will present Lights Shimmering Between Realms, a solo exhibition by ob. ob is among the new generation of artists who grew up in an environment where video games and SNS have always been part of daily life. Six years since her first solo exhibition at the age of eighteen with the gallery, the artist presents a series of artworks that chronicle the development of her career as a painter. Along with the paintings, an installation depicting the integration of girls’ divineness with a birthplace of art will be on view. It is a renewed and re-contextualized version of the cabin she originally conceived and produced over a month in Aomori for the group exhibition titled Bishojo: Young Pretty Girls in Art History at the Aomori Museum of Art (2014). We hope you will come and experience the fantastic mind journey of the young artist ob projected over the gallery space. By the word “light” I mean both a natural light and our souls. If we realized that we can cast our mind lights over each other in the way we feel the warmth of the sun through physical sunlight, it would be possible for us to see not only the physical world through our eyes but also our inner worlds illuminated by these lights through our minds. In this show, I would like to address with some landscape works the issue regarding the different possibilities of coexistence between nature and humans. Girls can transcend various distinct categories—past and future, dreams and realities, humans and nature—without belonging anywhere, having the ability to transform themselves into anything. The word “between (awai)” in the show’s title represents such aspects of girls in general, namely their freedom, imagination, and prayers. The painting In Our Next Lives tells a story of a girl who falls in love with a horse. In this narrative work, I depict a love between individuals of different breeds, social positions, or religions (whether it is between a man and a woman, men, or women). It is about the awakening of pure love portrayed over a background of abnormal taboos. I hope the audience will feel the difference and fluctuation between the natural sceneries filtered through girls and the ones we actually see with our physical eyes. For some time now, ob has been depicting young girls’ complex and profound psychological folds with delicate and nuanced texture in her paintings of girls with large, black eyes. Many of her early works give an impression that her subject, a girl, trapped in a “cage” that is the painting, is settling further and deeper into her inner self; they often leave the audience with a sense of coarse disquietude. In recent years, however, her style has been seeing a marked shift, as though some internal change took place in her subjects’ psyche. While the works remain consistent in that they lyrically communicate the complex nuances of an adolescent heart, the expressions on the subjects’ faces seem to emanate calm that indicates their openness to being in contact with the external world. Another notable and defining feature of ob’s work is her depiction of space. With a delicate brushwork and quintessentially pale palette, she creates the atmosphere that possesses both Rothko’s mysteriousness and Redon’s dreaminess. In her recent works, light shines into the space that surrounds and supports the girls—which used to be an abstract space reminiscent of an ocean of particles in which life drifts—and gives shapes to figurative images, pushing the narrative aspect of her work closer to the foreground. ob created In Our Next Lives, the work that anchors this exhibition, in Aomori for the group exhibition, Bishojo: Young Pretty Girls in Art History, which was planned by and toured through Aomori Museum of Art, Shizuoka Prefectural Museum of Art, and Iwami Art Museum, Shimane between summer of 2014 and early 2015. Within the small, independent space that is a cabin, ob fully utilized the three walls as well as the ceiling and the floor to complete a painting based on a local folklore of the Tohoku region, a tragic love story between a girl and a horse. 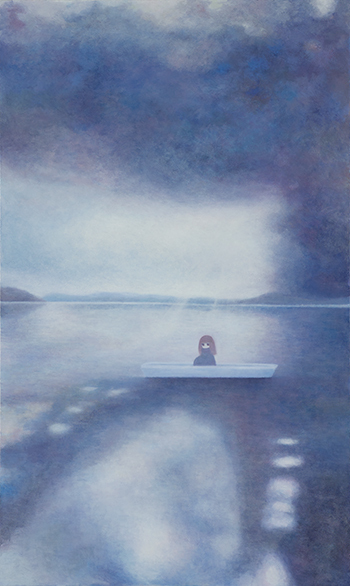 It can be imagined that coming into contact with the diversity of regional and human consciousness through nature and customs of Tohoku, as well as recognizing the radiating power of painting through working with the cabin, a mechanism that functioned like a chapel and let her imagery gently enfold the viewer, have been a major trigger that brought about the artist’s shift in style. What ob calls a “landscape” could perhaps be interpreted, then, as paintings depicting the growth of a girl through contact with the external world or the Other. In the first place, landscape is brought about by light. Humans receive light with our sensors, eyes, and are only able to “see” it as an object after it is processed in our brains. Landscape, therefore, forms within individual brains, and have a different meaning for each person. There is the inner light of one’s heart, the light of the external world, and the landscape that arise from the space in between: this “awai (in-between realm), ” to borrow ob’s words, generates as many narratives as there are viewers. At first glance, ob’s work may seem to depict small stories, but the artist weaves expansive narratives with universality that anyone could relate to by abstracting her motifs and themes through the act of painting. The various allegories told through ob’s girls, then, are also profound inquiries that explore the origins of human life. Ultimately, we cannot escape the structure of our biological brain. The world of visual literature ob creates teaches us that what captivates our heart is a good narrative. In that sense, her work contains elements that justly place it in art history; at the same time, it also comes with an intrinsic critique toward Japanese contemporary artistic expressions, in which intensely personal acts and expressions of thoughts seem prevalent.